He’s been called the Caped Crusader, the Dark Knight, and the World’s Greatest Detective. He’s been around for over 75 years. He’s manifested himself across every seam of popular culture, from comic books to TV shows, movies to video games. He’s even the subject of a university course in Canada. Simply put, Batman is one of, if not the most iconic and beloved superhero of all time. That makes the Bat a powerful figure and, to liberally paraphrase Uncle Ben’s last words, with great power, comes a whole lotta merchandise. There’s Batman beanie hats, Batman bobble heads, Batman baubles, Batman biscuits… think of any item under the sun, and there’s probably a Batman-themed version of it, making it difficult for the average Batfan to figure out where to invest their cash. That's where we come in. 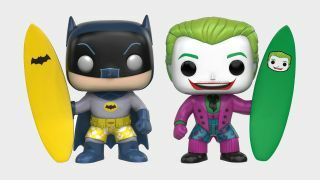 In the list below, you’ll find a collected assortment of the best Batman merch out there, with a range of affordable and premium options so that no budget will be left unfulfilled. Forget Batman, who played the best Bruce Wayne ever? What’s a Batman enthusiast’s collection without the most prestigious version of the best Batman movie trilogy of all time? Sorry Batfleck, Clooney, and all the rest, but Christian Bales’ Bats reigns supreme when it comes to the character’s cinematic adaptations, even if it took him a while to (quite literally) find his voice. This edition of the trilogy is bundled with the Blu-Ray and Ultraviolet renderings of all three movies, alongside a bunch of exclusive special features and physical goodies. The best news is that, although you may have to import it from a third party, the collection has a pretty affordable price tag nowadays, thanks to muted demand now that everyone is obsessed with the new DCEU instead. When Zach Snyder first revealed Ben Affleck’s new getup for Batman v Superman: Dawn of Justice, reactions were divided to say the least. However, ever since the actor won fans over by being the best thing about that movie, that beefy outfit has started to accrue a fair deal of respect and admiration. Rubie’s version of the suit, based on what Bats is wearing in the upcoming Justice League movie, strikes a nice balance between authenticity and affordability, perfect for Halloween, fancy dress parties, and casual cosplay. There’s even a detachable utility belt, though you’ll probably just be storing your wallet and keys in there, rather than any smoke bombs. Who’d have thought we’d be living in a world where the Lego Batman movie represents one of the best Batman flicks of all time? No one, I’d imagine, but I’m sure Lego is thankful either way, as the company produced a new range of Batman sets last year to celebrate the release of the animated movie. This Arkham Asylum package is particularly tempting, as it comes loaded with a range of characters and themed pieces for re-living all your favourite Arkham-set stories within a brick-based model of the classic Gotham location. It’s a little pricey (this is Lego, after all), and you’ll have to build it first, but the end results make for a fantastic mantelpiece ornament that’s sure to spark a whole number of dinner party discussions. There’s hundreds upon hundreds of Batman statues and figurines out there, but Hot Toys takes inspiration from the very first on-screen interpretation of the hero to create a truly prestigious purchase. This Adam West replica is authentically realized right down to the finest details, and can be equipped with a range of gadgets from the original 1960’s live action TV show, including that infamously large bomb. 30 points of articulation, 13 interchangeable gloved palms, 12 inches tall...holy fish fingers, Batman, this is a must buy for any DC collector. Three years ago, DC celebrated Batman’s 75th anniversary by releasing a special collection of three of the character's best comic book stories; Batman: The Dark Knight Returns by Frank Miller, Batman: Hush by Jeph Loeb, and Batman Vol. 1: The Court of Owls by Scott Snyder. If you became a Batman fan via a medium outside of the character’s comic book origins, why not return to the hero’s paginated home by splashing out on these seminal stories? It’s a decent price for three fantastic reads, all of which come wrapped in a beautiful sleeve casing, laden with gorgeous artwork. Go on, you know you want to. Rocksteady’s Batman games remain the pinnacle of superhero-flavoured interactive entertainment. While the third game in the trilogy - Arkham Knight - had its ups and downs, this remastered collection of the first two titles, Arkham Asylum and Arkham City, are still worth owning even if you already played them all those years ago. Rocksteady has brushed up each game’s visual coat of paint with richer textures, improved resolutions, and healthier framerates, plus all previously released DLC comes loaded in from the get go. Together, they represent an interpretation of the Bat-verse that first indulges in the horror aspects of the source material, before expanding its scope with Arkham City to become a fully fledged open-world superhero game like no other. A must have for the Batman lover, but also for fans of the medium at large. Let’s be clear, this kit is definitely not worth the extortionate price tag, and I would strongly advise against even thinking about picking it up... Buuuut, as one of the rarest pieces of Batman merch out there, I felt nothing less than obligated to show it some TLC on this list. A few years ago, Montegrappa teamed up with DC to produce a high quality, limited edition set of bespoke Bat items, boxed up in a beautiful looking package. It came with cufflinks, a fountain pen, a watch, and some nice looking reading material but, even then, the price tag was quite high. True to its word, Montegrappa are no longer selling the product, but those who originally bought in are now attempting to flog the kit off for an even more ludicrous buyer’s fee. That makes it a piece of Batman merch worth dreaming about, even if we’ll never get to see it in person. Let’s face it, all of us have wanted our own bespoke Batarang at some paint, even if we’re too scared to throw it, should it shatter before our very eyes or accidentally whack someone in the face. This officially licensed replica of the Batarang seen in The Dark Knight Rises offers good value for money, with a faux gold finish and a sturdy frame for hanging it on the wall. It’s 9 inches long with sharpened edges and a high grade metal composition, mind, so don’t think for a minute that it can be used as a children’s toy (sorry).